When it comes to printers for me, it has to offer all the functions that I will be using it for. It needs to offer a quick connectivity and print on the fly, because as a business owner, I have no time to wait for pages to be printed and ultimately, I need something that will be long lasting – with no need to keep spending money on inks or toners. The ET-4550 fits the bill. It’s expensive if you’re a casual printer, no pun intended, but it you run your business from home and not looking for a heavy duty printer that takes up space, then this is for you. The top line for me: It comes with enough ink to print 11,000 monochrome pages or 8,500 colour pages. 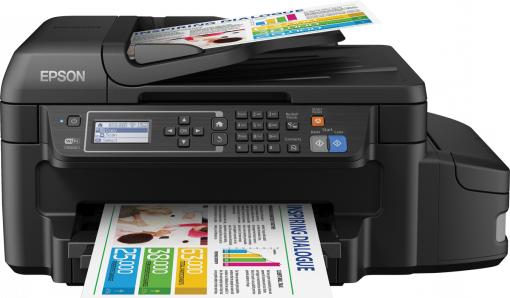 It has all the functions you could ever ask for like printing, faxing documents, scanning document, and making copies. For ease of use and productivity it has an automatic document feeder and in terms of connectivity, you have an ethernet port or you can also do away with cables and connect wireless via Wi-Fi. If you sometimes print from your smartphone like me, whether Android or iOS, you can also use Wi-Fi Direct to print your documents very quickly from a touch of a button. With WiFi available, you can you can print and scan through the cloud; using the Epson Connect service, you can save your scans to places like Dropbox, Evernote, and Google Drive, which I find very useful. I can scan my passport to my dropbox and share on to our travel booking agency for example. Design-wise, it looks like a printer (yes it looks likes a printer, not a Ferrari), and you may laugh at that comment, but its looks means it sits well in your home office setup without looking like a useless piece of equipment or some old printer, it’s modern, doesn’t take up a lot of space and the buttons are clearly labelled and easy to understand. The placement of where you put your papers and collect your printouts are intelligently laid out also. As part of the Eco Tank family, and as the name suggests, it’s very Eco-friendly and no need to buy cartridges and toners, you simply adds ink inside the tanks on the side of the printer, and it ships with bottles of ink to last you a very long time – believe me, you’ll find excuses to start printing things. You get a 30-sheet automatic document feeder, handle up to legal-size pages and up to 150-sheets. Like many professional or heavy duty printers out there, you can also do two-sided printing, which helps save paper if you are into saving trees. Overall, it is very easy to setup, it took me under five minutes minus unboxing it and it prints very well. If “prints very well” sounds vague, you’ll be happy to hear the texts looks clear, the print quality is really good, inks aren’t bleeding, letters aren’t crooked and images looks good whether printing monochrome or in multiple colours. It does exactly what it says on the tin and the only thing i didn’t test was the fax functionality, who still sends fax? Got a question or want to find out how I’m getting on with it? Follow me on Twitter @gadgetsboy or drop comments below. In general it’s a really good printer. For photos, it can print 4,800 x 1,200 DPI, which means you will get good quality, however what I always say is use photo paper. Because pictures are what they are, it will still use more ink than your normal printing but still better than the printers where you have to replace cartridge. Hope that helps.